Stick a colourful piece of paper on the side of a rim of a wheel and make the wheel roll away. If you observe carefully you’ll see, whenever the paper is near the ground, it appears clearly. However when the paper is at the top of the wheel, furthest from the ground, the paper appears hazy. Also if you observe the spokes of a wheel of a moving cart, you’ll see that the spokes at the lower part of the wheel appear clearly. While the spokes of the upper part appear to blend into a single body, as if travelling much faster than the lower part. It seems, the upper part of the wheel is travelling at a higher speed than the lower part of the wheel. How can that be, when both are physical extensions of a single object? Yes, in fact the upper part does travel faster than the lower part. This sounds incredible, while it seems very ordinary to others who understand the simple physics of it. The physics involved really is very basic. So basic that I’m sure many reading this are cursing me for writing something so ordinary. But I find it really incredible. And believe me, there still are people who need to know this. Let’s suppose the wheel moves at a speed of v in the right direction. However that is just the speed of the centre of the wheel. The upper part of the wheel for instance rotates at a speed of, say v, and also translates in the same direction at a speed of v. So, the speeds add up. And the top is travelling at a speed of 2v. Similarly, at the bottom part of the wheel, the rotation is in the opposite direction (towards the left) and translation is in the right direction. Hence the speeds get cancelled and the lowest part of the wheel is stationary. These are the topmost and bottommost points I’ve discussed here. 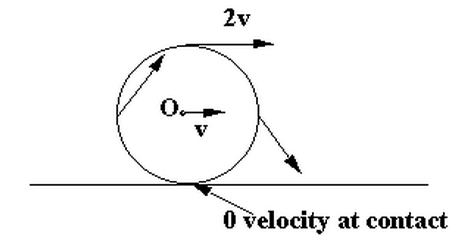 For all the other points on the rim the rotational speed v gets split into a horizontal and a vertical component. So their speeds vary and lie in between 0 and 2v. Some call it the cartwheel riddle.